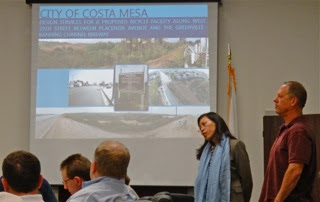 The Costa Mesa Bikeways and Walkability Committee met again Wednesday evening at City Hall and managed to fill the time provided with productive discussions. The committee membership is down to twelve (12), plus Brent Stoll and Dr. Kirk Bauermeister. Two members and Stoll were absent last night. 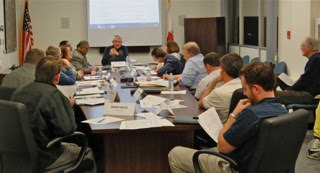 Three positions will be filled with the current recruitment effort for this and several other city committees. Applications must be received by 5:00 p.m., Friday, February 19th. 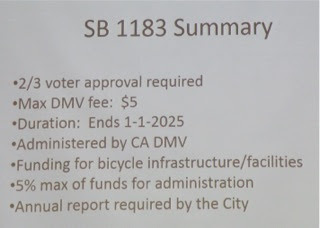 Member James Kane did more work on an analysis of Senate Bill 1183, HERE, which theoretically provides for up to $5.00 per vehicle annually to be assessed by cities, counties or other park districts to fund bicycle enhancements within their boundaries. 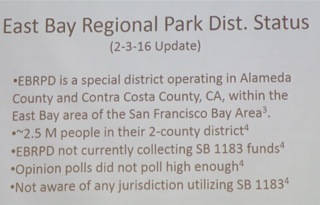 The following slides outline what he found out. Apparently, there are NO jurisdictions who have taken advantage of this bill. It would apparently take a local vote to enact the process and there are few politicians willing to impose a new tax. It's an interesting concept, though. 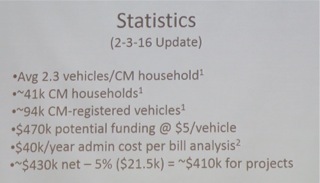 According to the data Kane provided, it could provide net revenue of more than $400,000 annually for such efforts. There was a presentation by Min Zhou, Project Manager for KOA Corporation, the consultants working on the 19th Street Bike Path project. They gave an overview of the project to the committee and answered several questions. This plan will be presented as a community outreach effort in the near future, so members of the community nearby or with special interest can attend in a larger venue to hear the plans and offer comments. 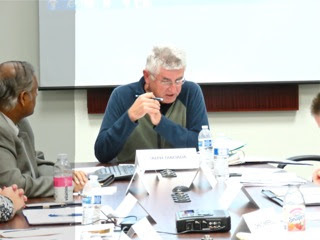 PRESENTATION OF GOALS, OBJECTIVES AND.... "RECOMMENDATIONS"
Chairman Ralph Taboada and Vice Chair Cynthia McDonald briefed the committee members on their presentation of the Goals, Objectives and Policies presented to the City Council at a recent meeting. 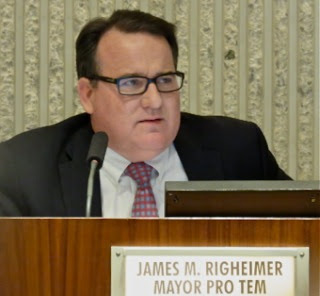 Much discussion revolved around the negative reception their work product received, and the demand by Mayor Pro Tem Jim Righeimer that the "policies" be modified to be called "recommendations", even though the format is the preferred style for the General Plan update. I sat through most of the meetings where this committee met and hammered out this excellent piece of work on a rushed timetable. I, too, was surprised and disappointed with Righeimer's reaction to it. Yes, there were a lot of words, and, yes, it took some time to carefully craft the document - but that was their charter. Personally, I think there's more at play here. I think that Righeimer realizes - although he didn't say it - that the "rules" provided by the "policies" might negatively impact some future developments by his pals. By calling them "recommendations" the staff can be instructed to simply not enforce those Righeimer finds objectionable. There was also a lengthy discussion of the completion of the Bicycle Map for the Master Plan. 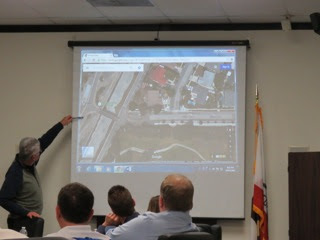 An example of a conceptual map was reviewed and, after discussion, it was agreed unanimously to put that map forward. There was significant discussion about the method of presenting this map, with some members favoring approaching individual members of the council, while others strongly suggested to not use that tactic. The committee will present the map to the council as a whole. Also on the agenda was a opportunity for the creation of a ciclovia subcommittee. 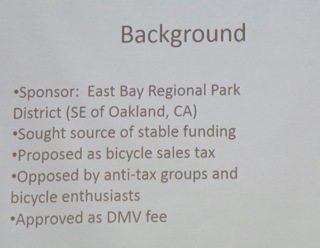 I wasn't at the meeting where this was proposed as an agenda item, but it seems like the plan was to form a smaller group to move forward with all elements of a possible ciclovia event similar to others held elsewhere. When it came time for volunteers for this committee nobody stepped up. The subsequent discussion resolved that it may be too soon for such an effort for this fledgling committee. 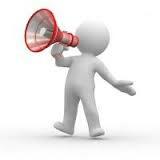 So, the conversation then turned to the creation of a broader Outreach Subcommittee, to begin with smaller steps. Four members stepped up for this group - Chairman Taboada, Vice Chair McDonald, Rick Huffman and Jim Erickson. The committee will wait until the next meeting, when a couple more members may be present, to fill out the five-person subcommittee and tighten the focus of its activities. Discussions revolved around creating a presence at currently-existing programs in the city - like the Fish Fry and the Community Run - to launch greater awareness of this group and their efforts to improve bikeability and walkability in the city. 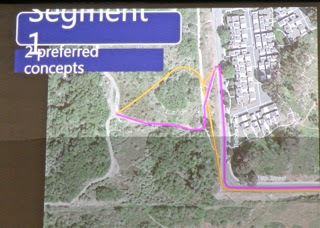 There was a brief slide presentation requested by Parks and Recreation Commissioner Bob Graham, who was in the audience last night, regarding the possibility of finding a way to open two locked gates on the trail that parallels the Greenville-Banning Channel on the Westside of town to provide access to walkers. The next meeting will be held on March 2, 2016 at the Costa Mesa Senior Center, which is undergoing termite treatment. The meeting adjourned at 9:07 p.m. and the 9 members of the public in attendance departed. Geoff, you had the same thoughts I did about "policies" vs. "recommendations". Call me skeptical, but we all know Righeimer puts his development buddies first. Nothing stands in his way. You bet there is something bigger at play here.